In 1985 Chris left his studies in language in his native England to travel, and shortly thereafter became a street mime in Europe. Since 1987 he has been based in the US and has performed his solo shows at thousands of community and corporate events around the country, and the world. For Chris the most rewarding work is to combine performing with travel, being of service, and using languages (he speaks a little of the language of each place). No exception is his work with Magicians Without Borders, which took him most recently India, with Tom and Janet, to teach mime at and magic to at-risk youth, and to perform shows in orphanages, hospitals, schools and other communities. He has also worked with MWB in El Salvador. Chris has also worked extensively with the Connecticut music/arts-diplomacy organization, Project Troubador: in the Dominican Republic, Cameroon and Benin he was part of teams using music and theater to promote HIV/AIDS awareness; in Bangladesh he performed at the celebrations of the country’s leading children’s magazine Toitomboor; in Morocco he toured schools with PT co-directors and musicians, Eliot Osborn and Louise Lindenmeyr; he has worked all over Haiti including teaching mime to local actors, and performing for patients while Louise (also a nurse practitioner) ran rural clinics. Other countries Chris has traveled to have included Japan, where he performed at the Huis Ten Bosch Theme Park , and China, for the Kimtom International Clown Festival of Shanghai. In Curaçao his show carried a non-violence theme to schoolchildren on behalf of Mundo di Mucha who are developing a children’s museum. With AT&T’s Circo Mundial in Puerto Rico he performed in the ring as well as directed their Clown Doctor Program, which visited hospitals and disabled centers. Closer to home he has worked with New England’s Enchanted Circle Theater, touring international folk tale shows to schools and libraries. He performs regularly at, Providence Children’s Museum, and the International Children’s Festival of Hampton Virginia, Falcon Ridge Folk Festival. 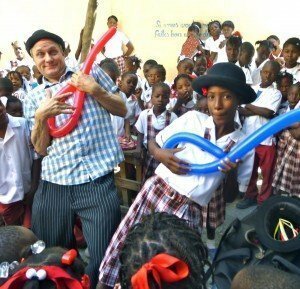 Chris’s travels have sparked involvement in development work too: he has led a campaign to build a school for the deaf in the Dominican Republic, and is currently a board member of Haiti Orphanage Sponsorship Trust, a Vermont non-profit that supports, and visits an orphanage in Haiti.